The ever-abundant okra is a regular at our home. Armed with fresh tender okra from rythu bazaar (farmer’s market), I made this light, bright and healthy okra stir fry along with Pappu pulusu for our meal today. The addition of roasted peanuts enlivens the okra and lends a crunchy layer of flavor. Just do your best not to overcook okra beyond recognition, they should be soft yet retain a bit of crunch. 1 Wash the okra, dry them, chop tip and tail ends. Chop into 1/2″ pieces. 2 Heat oil in a cooking vessel. Once the oil is hot, reduce heat to medium flame, add the mustard seeds, let them splutter, add the cumin seeds and let them brown. Add the curry leaves, stir them for a few seconds. 4 Add the chopped onions and saute till transparent. Add the okra and turmeric pwd and combine. Saute on medium high heat for 3-4 minutes. Now reduce to low flame, add a tbsp of yogurt or lemon juice (to reduce slime) and let it cook for 4-5 mts. Saute in between so that they don’t burn. Add the chilli pwd, cumin pwd and coriander pwd and reduce flame and cook till the okra turns soft. 5 Donâ€™t overcook the okra, they should retain that, slight crunchy texture. Add the roasted peanus at this stage and combine well. Let it cook for another mt on medium high heat, season with salt and turn off flame. 6 Serve hot with steamed rice. Adding groundnuts is a good idea Sailaja. Looks yumm. Wow, all those yummy veggies from rythu bazaar! Hope you are enjoying all those mangoes and watermelons on the season. My husband and I love stir-fried okra, but this is the first time I’m seeing peanuts in it. Looks interesting. Looks delicious. I have tried so many receipies from your website and enjoyed them well. Your website is very useful for people like us who are new to kitchen. Apart, I observed that your receipies and Photos are being published in SAAKSHI telugu news paper under different cooking title. Is it with your permission? Thank you for your positive feedback, Swetha. I have not given permission to Saakshi newspaper to use content/images from my site. I appreciate you informing me. I have never cooked okra with peanuts or any kinda nuts. Interesting. Why have you specifically mentioned that Bindi’s should not be small sized? And will addition of garlic add to the flavour of the recipe? Garlic is an optional ingredient and will add to the flavor. 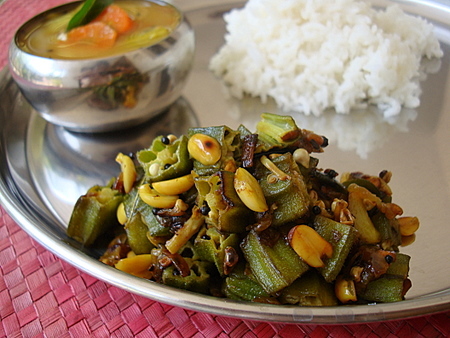 If chopped too small, during the cooking process, the bhindi might not hold shape. ur website is useful 2 me.i tried bendakayavepupu.it was so tasty.thank u.
hi.. pls can u tell me the way 2 wash off stickiness from bhindi pieces.. While cooking bhindi, add a tbsp of lemon juice or yogurt. The stickiness will disappear. 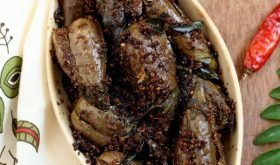 hiiii sailaja i love your recipes simply awesome……im just 19 and i love cooking regularly at home as mom comes home tired from work i would like to know if i could omit the roasted peanuts in the above recipe??? Yes, you can omit the peanut part.